Heat a sauté pan over high heat. Add the garlic, tomato and onion, and toast for 5-6 minutes. The vegetables should have some black spots and be almost cooked through. Remove from heat and place in blender. Add the oil to the pan. Quickly toss the peppers in the pan, removing from pan as soon as they start to change color. Add to the blender. Pour the stock into the pan and let boil for a couple minutes, then transfer to the blender. Add cilantro and puree all ingredients until smooth, and season with taco seasoning, cayenne, sea salt and pepper. Cut the eggs in half lengthwise and remove the yolks. Set the whites aside. Place the egg yolks into a bowl. Cut the avocados in half, then peel and seed. Add the avocado to the bowl of egg yolks along with the onion, cilantro, lime juice, taco seasoning and garlic. Mash everything together well and season with salt and pepper. I also added a bit of Tobasco sauce. Place the avocado eggs into a plastic bag and cut off one of the corner tips. This will be your piping bag. Squeeze the mixture from the bag into the egg white center holes and sprinkle the tops with taco seasoning and sea salt. Serve atop a small pool of Chile Salsa. 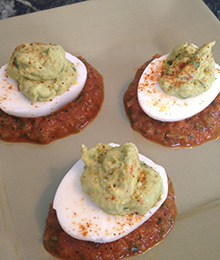 So Why are "Deviled Eggs" called "Deviled"? Here's the history behind the the name. An Englishman by the name of William Underwood set up a small condiment business on Boston's Russia Wharf in 1822. It did pretty well both developing and selling new condiment products. Around 1868, Underwood's sons began experimenting with a new product created from ground ham blended with a mix of special seasonings. They introduced a product line of seasoned meat products including ham, turkey, chicken, lobster, and tongue. They called the seasoning process "deviling," and the Underwood "red devil" was born. Today many other foods, including eggs and crab, are served "deviled." To be considered deviled, a food has to have a kick from something like Dijon mustard, hot sauce, cayenne pepper or chopped hot peppers.